Every year, YouTube compiles an ever-growing list of Black Friday montages in which crazed shoppers fight over heavily discounted items. Most of the videos take place at big box stores, which is where large crowds tend to congregate. But Black Friday is a major cash cow for all retailers — big and small. In fact, more than 100 million people brave the madness (in-person) every year. That’s just on a single day. Millions more go shopping on Small Business Saturday, generating $15-plus billion in sales for local retailers. Despite the yearly video montages of Black Friday madness, many consumers never actually leave their homes to shop. In 2017, for example, e-commerce merchants raked in nearly $8 billion in online sales over Thanksgiving and Black Friday — a 20 percent increase over the previous year’s haul. Almost $1.5 billion of that came exclusively from purchases made through smart devices. These figures don’t even include Cyber Monday — a shopping holiday in which online retailers generated $6.59 billion in 2017. Even if you don’t have the budget or name recognition of big box stores, the Black Friday weekend isn’t something you should ignore. With the right preparation, it’s possible to carve out your own slice of this multibillion-dollar pie. Black Friday might be an autumn shopping holiday, but you should begin your preparation in summer. More specifically, start exploring ad buys and marketing opportunities before rates become too expensive. In addition, make sure your refund policy is up to snuff. Every year, an estimated 43 percent of shoppers regret buying at least one Black Friday sale item. As a retailer, you should make it as easy as possible for people to request refunds and exchanges. Otherwise, you’ll likely get hit with chargebacks. Sometimes, these customer-initiated refunds are done for legitimate reasons. Yet many consumers abuse this system by knowingly purchasing items with the deliberate intention of claiming dissatisfaction with their purchases. Known as “friendly fraud,” they often keep the items they bought while still receiving refunds from their credit card issuers. Preventing friendly fraud is difficult no matter what time of year it is. Yet, during the busy holiday shopping season, figuring out fake complaints from legitimate ones is next to impossible. Your best protection is to offer hassle-free refunds. You’ve bought all your ads, discounted your inventory, and posted a clear refund policy. But as a brick-and-mortar retailer, there’s still more work ahead. The same goes for holiday music . With the right playlist, you can tug at your customers’ heartstrings and encourage them to spend more. In addition, you should train your staff to provide better-than-average customer service during the Black Friday bonanza. Tensions tend to run high during this shopping holiday. By providing courteous and personalized attention, you can help diffuse some of this madness and create a more pleasant shopping experience for everyone. When selling items online, though, there are additional considerations. Optimize your site for mobile This means having a responsive site that looks great on all screen sizes. 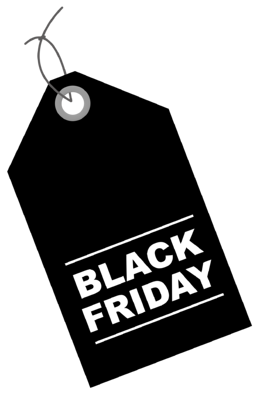 In fact, your entire e-commerce strategy should be mobile-focused given that more than 61 percent of all Black Friday Internet traffic happens through smart devices — not desktops. Make sure that your site loads quickly. This is especially important for mobile devices that typically have slower connection speeds. Even if you have a speedy site, you should consider buying additional bandwidth for the holiday shopping season (from Black Friday until New Year’s). Approximately 20 to 40 percent of all small business sales take place during this period. Your site must be able to accommodate this seasonal spike. Worried About Surviving the Next Black Friday? Depending on when you’re reading this, there may not be enough time to implement all of the above suggestions before Black Friday 2018 arrives — but don’t worry. These tips are applicable all year. The sooner you start using these strategies, the better you’ll be. If you’d like even more Black Friday survival tips, schedule a free consultation with our team today.